(a) Apply lithium soap base glycol grease to 2 new grommets. (b) Install the 2 grommets onto the brake master cylinder reservoir. 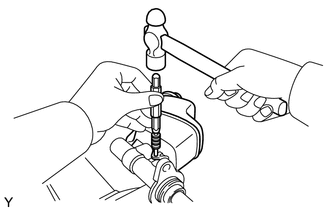 (a) Install the brake master cylinder reservoir to the master cylinder body. (b) Fix the brake master cylinder in a vise between aluminum plates. (c) Using a pin punch and a hammer, tap in the straight pin.